Most parents consider having their child see an orthodontist for two reasons: (1) Their dentist told them that their child’s teeth are malaligned, a problem which will eventually affect their oral health; and/or (2) they are concerned about the appearance of their child’s mouth. Large spaces between the teeth, crooked lower teeth, and a protruding over-bite or bucked teeth are a few of the most common complaints. The qualified orthodontist is trained to diagnose and correct such problems. Braces are the handles used to move your teeth in a positive manner. They vary from the conventional steel bands cemented around the teeth, to less obvious brackets bonded or cemented to the outer surfaces of the teeth. Ceramic brackets, which are similar in color to teeth, are less obvious to the casual observer and offer the versatility of regular stainless steel braces. The latest ones are translucent enough to actually allow the natural shading of the teeth to show through. In all cases, regardless of the braces used on your child’s teeth, the activating part of your braces is the wire that goes from tooth to tooth. It is not uncommon to observe half of the children in a school class having some sort of braces. 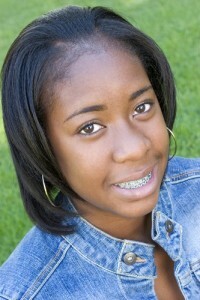 Many kids consider braces the “cool”, “neat”, or “in” thing. All of us approach any new project with some apprehension. We expect you will feel the same at this point. The following pages contain some of the most frequently asked questions we hear from parents considering orthodontic treatment for their child. We hope the answers provided would help with your understanding of orthodontics and what it can accomplish. Q: What are orthodontic records and why are they necessary? A: Orthodontic records usually include X-rays, photographs of the teeth and face, and models of the teeth. The records provide a wealth of information that is not always revealed by a visual examination. This may include missing teeth, extra teeth, the condition and development of tooth roots, growth patterns of the jaws and face, symmetry, and a host of other factors. Complete records form the basis for a thorough and accurate diagnosis and a sound treatment plan. Our office’s orthodontic records even includes a complimentary hand/wrist radiograph routinely in our growing children and adolescent patients. We find it useful in determining how much further growth to expect in our patients, as well as predicting with reasonably good accuracy how tall our patients will be when their growth is complete!!! Q: Why is “early treatment” recommended for some children? A: In some cases, preventive or interceptive care can guide the jaws and erupting teeth into more favorable positions, improve the growth and alignment of the jaws, preserve space for the permanent teeth, and/or reduce the likelihood of fracturing protruded front teeth. 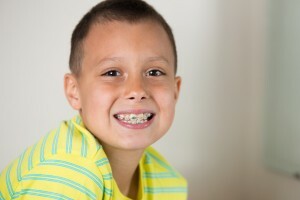 Q: At what age should my child see an orthodontist? A: Most people in the dental profession agree that six or seven is a good age for your child’s first orthodontic examination. Conditions may be found that can be corrected at this early age by interceptive measures. This often will lessen or eliminate the need for help at an older age. That in turn can be a savings in the total cost of your child’s orthodontic correction. Please do not wait until your child has lost all of his or her baby teeth. There are definite advantages to correcting many problems at an early age. Waiting until all baby teeth are lost can often complicate an otherwise fairly simple problem. Let your orthodontist decide the best time to intercept or correct your child’s orthodontic problem. 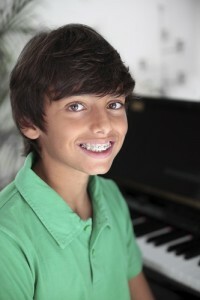 Q: Why is the adolescent growth spurt so important in orthodontics? A: This is a time when much of the growth of the face occurs. Treatment during this period provides an opportunity to favorably influence the facial profile in a growing child. Once growth is complete, correction of jaw discrepancies usually requires surgery. For this reason, early treatment may save considerable time, and money. A: A bad bite can be detrimental to the future of your child’s mouth. Restorations, crowns or bridges are often impossible for a dentist to perform without prior repositioning of the teeth by an orthodontist. Properly aligned and supported teeth are healthier, easier to clean, and therefore more likely to last throughout a patient’s lifetime. A: Heredity is a complicated combination of factors. Both parents may have perfectly aligned teeth. And the first child’s teeth may erupt uneventfully. Then comes the second child and it is as if hereditary factors are working against each other. The child’s teeth appear normal, but their alignment is going to cause problems in the future. So, assume neither the best nor the worst. Have your orthodontist evaluate your child’s bite and proceed from there. Q: Am I too old to get braces with my child? A: For those who can benefit from orthodontics, age is not a factor. Adults who have teeth and healthy supporting structures are never too old. Increasing numbers of adults are taking advantage of the lifelong benefits of orthodontics. These are people who have made the choice to spend the rest of their lives with an attractive, healthy smile and the confidence that it brings. 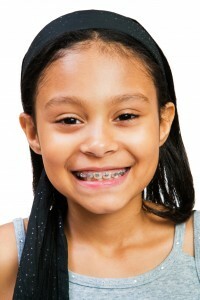 In fact, quite a number of adults begin to wear braces at the same time that their children do, as a “parent-child” team. We have even found some children to be more compliant and eager to wear braces when they can share the experience with their parents. A: Tooth movement is actually a normal response to light pressure. Pressure is applied by using a variety of orthodontic appliances, the most common being a brace or bracket attached to the teeth and connected by an archwire. Periodic changing of these archwires puts pressure on the teeth. At different stages of treatment your child may wear a headgear, elastics, a positioner or a retainer. *In orthodontics, as in all other healthcare treatment, there can be no guarantees of particular outcomes. The anticipated benefits noted here are based on results from treating similar orthodontic conditions, and may vary with the individual, his or her cooperation, and a number of other factors. Also, diagnostic records may be necessary for a more accurate orthodontic evaluation. A: Orthodontic correction can vary from the comparatively simple closing of front spaces in a few months, to the realignment of unsightly and disfiguring teeth. In the young child or the adolescent, treatment is as much a critical matter of timing and guidance as anything else. The normal treatment time varies from eighteen months to three years depending on the complexity of the problem. A: We encourage your child to pursue extra-curricular interests. Athletics can be a regular part of this routine. Certain musical instruments can actually be helpful during treatment. Speech may at first be somewhat affected, but only for a day or two. So we tell our patients that orthodontics is a normal part of this phase in their lives and that treatment should not preclude any activities they usually pursue within their school’s programs. A: Do not assume your treatment will cost the same as someone else’s. Because no two problems are the same, treatment plans and accompanying costs will vary among patients. Those factors affecting the simplicity or complexity of your problem will be explained in detail by your orthodontist. All offices offer reasonable payment plans, conveniently spread over the estimated treatment period.